At La Danse Des Etoiles Villa in the Pointe Milou area of St. Barts, guests are invited to experience relaxation like never before. This spacious villa comes with 5 bedrooms with en-suite baths, as well as an additional bath. A large, open concept living area incorporates the living room, dining room, and the gourmet kitchen before opening onto the terrace. Out here, you will find an infinity pool that is surrounded by lounge chairs for sunbathing or just relaxing. All of this serves as the backdrop to the great ocean view, which can be enjoyed from several vantage points at the villa. Everything has been constructed in a modern style, but the numerous natural touches of wood and stone make this property utterly unique. This uniquely designed villa in the Pointe Milou area of St. Barts has been carefully planned to incorporate a modern style with lots of natural touches. This can be seen in the raw materials of wood and stone that have been used to construct the villa. The feeling is of a private oasis. The large living room flows into the dining room and gourmet kitchen, and the same attention to detail is apparent in this open and spacious central living area. The furniture in these rooms is comfortable, inviting you to sit and relax, taking full advantage of island living. Five bedrooms and six bathrooms offer the same modern yet natural style as the other rooms, and each offers a secluded retreat for guests who value their privacy. Outside, the expansive terrace stretches to the living area, so indoor/outdoor living can be easily accomplished. There are many seating areas, and a BBQ area is the perfect spot to grill and enjoy the great views of the sea while you cook and dine. 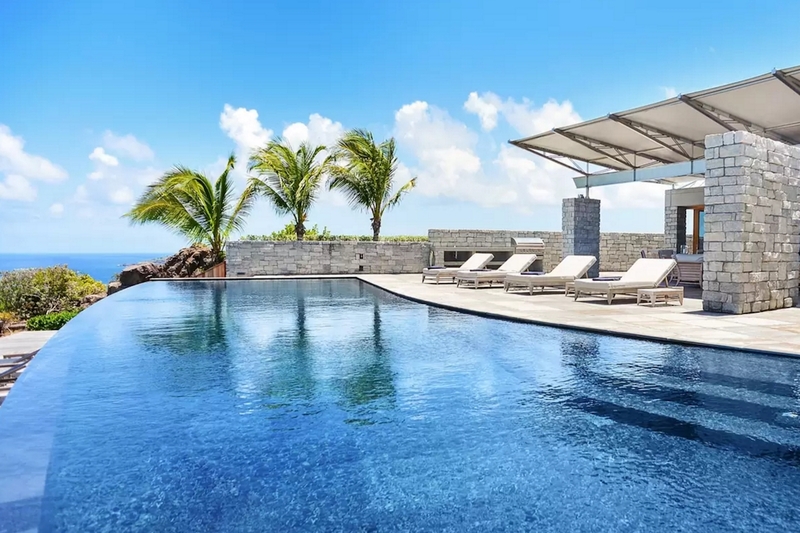 An infinity edge pool is lined with lounge chairs, and a lower level deck contains more of these comfortable chaises where you can sunbathe, relax with a book, or just gaze out at the sea.